To apply color to your image, check the Tint image checkbox. Then click the Color button to choose color. Please note that the original color is transparent. 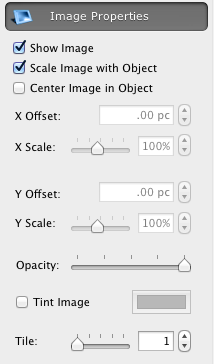 To change transparency of an image use the Opacity slider. The Tile Image tool creates multiple scaled down copies of the image in the original image area.